Eugene is an Associate Professor of Mining Engineering at the Bharti School of Engineering, Laurentian University, Sudbury, Canada. He is also the IAMGOLD Research Fellow in Open Pit Mining. He holds a MSc from the University of Mines and Technology and a PhD from the University of Alberta in Mining Engineering. 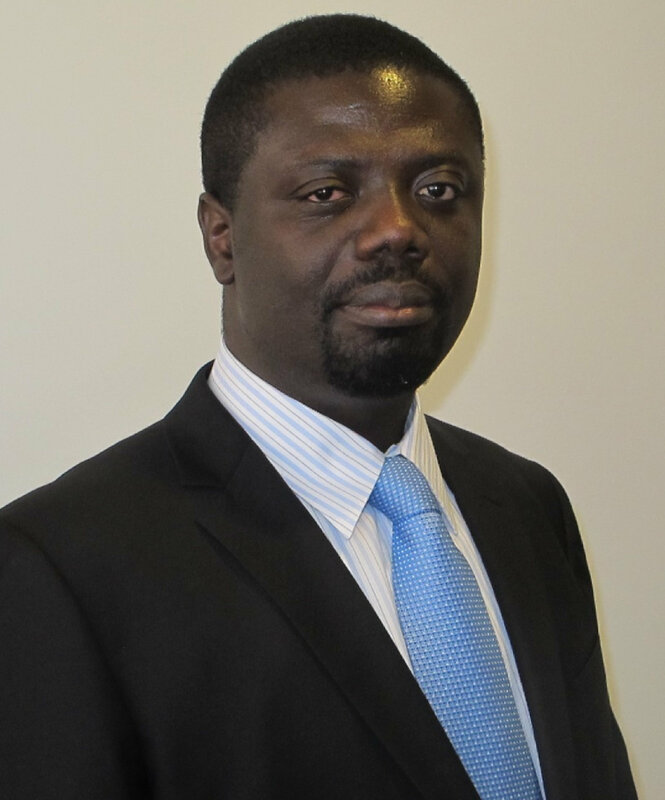 Eugene is a registered professional mining engineer and has extensive operational, consulting and research experience from Ghana, Canada and Australia in mine design and optimization, and mine production management. He teaches and conducts research in strategic mining options optimization, integrated mine planning and waste management optimization, simulation optimization of intelligent and autonomous mining systems, and applications of discrete fracture network. He is the Principal Mining Consultant for OptiSim Mining Solutions on mine optimization and simulation. He is a member of the West African Institute of Mining, Metallurgy and Petroleum (WAIMM) and the Canadian Institute of Mining, Metallurgy and Petroleum (CIM). Dr. Ben-Awuah's research interest focuses on providing sustainable mining solutions through the application of simulation and operations research methods. He is part of the industrial research consortium Mining Optimization Laboratory. Students' names are capitalized and presenters' names are underlined. 16. A. MAREMI and E. Ben-Awuah, (2018), "Uncertainty-based mine planning framework for oil sands production scheduling and waste management", Journal of Mining Science, 32 pages. Submitted: June, 2018. 15. S. HUANG, G. Li, E. Ben-Awuah, B. OPPONG AFUM and N. Hu, (2018), "A robust mixed integer linear programming framework for underground cut-an-fill mining production scheduling", International Journal of Mining, Reclamation, and Environment, 26 pages. Submitted: November, 2018. 14. N. SEYED HOSSEINI, E. Ben-Awuah and Y. Pourrahimian, (2017), "A two-step approach to incorporate cut-off grade and stockpiling in oil sands mine planning optimization framework", Computers and Operations Research (Special Issue in Mine Planning), 34 pages, Submitted: August, 2017. 10. M. M. BADIOZAMANI, E. Ben-Awuah and H. Askari-Nasab, (2015), "Mixed integer linear programming for oil sands production planning and tailings management", Journal of Environmental Infomatics, 40 pages, Accepted: January, 2017. 11. A. MAREMI and E. Ben-Awuah, (2018), "Integration of mine-to-mill production planning strategy for oil sands mining and waste disposal", Proceedings of the 6th International Oil Sands Tailings Conference (OSTRF), University of Alberta, Edmonton, Canada, December 9-12, 18 pages. 10. A. MAREMI, E. J. A. APPIANING and E. Ben-Awuah, (2018), "Estimating production schedule financial risk using a multi-objective mixed integer linear goal programing model", 5th UMaT Biennial International Mining and Mineral Conference (UMaT 2018), Tarkwa, Ghana, August 1-4, 2018, 22 pages. 9. F. KHODAYARI, Y. Pourrahimian and E. Ben-Awuah, (2018), "Application of mathematical modelling for draw control under material flow uncertainty", Proceedings of the 4th International Symposium on Block and Sublevel Caving (Caving 2018), Vancouver, Canada, October 15-17, pp. 815-822. Submitted: March 2018. 8. W. R. JUNKIN, L. Fava, E. Ben-Awuah and R. M. Srivastava, (2018), "Analysis of MoFrac-generated deterministic and stochastic fracture network models", Proceedings of the 2nd International Discrete Fracture Network Engineering Conference (DFNE 2018), ARMA, Seattle. USA, June 20-22, 9 pages. 7. N. SEYED HOSSEINI and E. Ben-Awuah, (2017), "Application of cut-off grade optimization for hierarchical oil sands production and dyke material scheduling with stockpiling", Proceedings of the 38th International Symposium on the Application of Computers and Operations Research in the Mineral Industry (APCOM 2017), Golden, Colorado, August 9-11, pp. 14:19-31. 6. E. Ben-Awuah, O. Richter, and T. Elkington, (2015), "Mining options optimization: concurrent open pit and underground mining production scheduling", 37th International Symposium on the Application of Computers and Operations Research in the Mineral Industry (APCOM 2015), Fairbanks, Alaska, USA, May 23-27, pp. 1061-1071. 5. E. BEN-AWUAH and H. Askari-Nasab, (2012), "A mathematical programming model for oil sands production scheduling and waste management", Tailings and Mine Waste Conference (T&MW 2012), Keystone, USA, October 14-17, pp. 593-608. 4. H. Askari-Nasab and E. BEN-AWUAH, (2011), "Integration of oil sands mine planning and waste management using goal programming", 35th International Symposium on the Application of Computers and Operations Research in the Mineral Industry (APCOM 2011), AusIMM, Wollongong, Australia, September 24-30, pp. 329-350. 3. E. BEN-AWUAH, H. Askari-Nasab, and K. Awuah-Offei, (2011), "Waste disposal planning for oil sands mining using goal programming", Innovations in Mining Engineering Conference, Rolla, USA, August 30-September 1. 2. E. BEN-AWUAH and H. Askari-Nasab, (2010), "Oil sands mine planning and waste management using goal programming", in Proceedings of Second International Oil Sands Tailings Conference, University of Alberta, Edmonton, Canada, December 5-8, pp. 149-162. 1. E. BEN-AWUAH, S. KALANTARI, Y. POURRAHIMIAN and H. Askari-Nasab, (2009), "Simulating the production of a multi element ore-body with an alternating crushing schedule", in Proceedings of the 18th International Symposium on Mine Planning and Equipment Selection (MPES 2009), Banff, Canada, November 16-19, pp. 150-162. 26. A. MAREMI and E. Ben-Awuah, (2018), "Uncertainty-based mine planning framework for oil sands production scheduling and waste management", MOL Research Report Nine, Mining Optimization Laboratory, University of Alberta, Edmonton, Canada, (ISBN: 978-1-55195-383-0), September 2018, Paper 103, pp. 32-65. 25. O. MBADOZIE and E. Ben-Awuah, (2018), "Incorporation of geo-metallurgical and geochemical properties in oil sands mine planning and waste management", MOL Research Report Nine, Mining Optimization Laboratory, University of Alberta, Edmonton, Canada, (ISBN: 978-1-55195-383-0), September 2018, Paper 105, pp. 75-104. 24. A. MAREMI and E. Ben-Awuah, (2018), "Integration of mine-to-mill production planning strategy for oil sands mining and waste disposal", MOL Research Report Nine, Mining Optimization Laboratory, University of Alberta, Edmonton, Canada, (ISBN: 978-1-55195-383-0), September 2018, Paper 106, pp. 105-130. 23. B. OPPONG AFUM and E. Ben-Awuah, (2018), "Optimizing the extraction strategy for open pit and underground mining transitions using mathematical programming", MOL Research Report Nine, Mining Optimization Laboratory, University of Alberta, Edmonton, Canada, (ISBN: 978-1-55195-383-0), September 2018, Paper 301, pp. 157-178. 22. S. HUANG and E. Ben-Awuah, (2018), "An optimization framework for cut-and-fill mining production scheduling using mixed integer linear programming", MOL Research Report Nine, Mining Optimization Laboratory, University of Alberta, Edmonton, Canada, (ISBN: 978-1-55195-383-0), September 2018, Paper 304, pp. 205-223. 21. E. J. A. APPIANING and E. Ben-Awuah, (2018), "Underground mining stope layout optimization and production scheduling: A review of existing solvers and algorithms", MOL Research Report Nine, Mining Optimization Laboratory, University of Alberta, Edmonton, Canada, (ISBN: 978-1-55195-383-0), September 2018, Paper 308, pp. 271-304. 20. W. JUNKIN and E. Ben-Awuah, (2018), "Emergent properties of MoFrac generated discrete fracture networks", MOL Research Report Nine, Mining Optimization Laboratory, University of Alberta, Edmonton, Canada, (ISBN: 978-1-55195-414-1), September 2018, Paper 402, pp. 343-361. 19. B. OPPONG AFUM, D. CAVERSON and E. Ben-Awuah, (2017), "Strategic evaluation of mineralized waste rocks as future resource", MOL Research Report Eight, Mining Optimization Laboratory, University of Alberta, Edmonton, Canada, (ISBN: 978-1-55195-383-0), September 2017, Paper 103, pp. 36-48. 18. N. SEYED HOSSEINI and E. Ben-Awuah, (2017), "Incorporating stockpiling and cut-off grade optimization into oil sands production and dyke material planning using goal programming", MOL Research Report Eight, Mining Optimization Laboratory, University of Alberta, Edmonton, Canada, (ISBN: 978-1-55195-383-0), September 2017, Paper 104, pp. 49-78. 17. B. OPPONG AFUM and E. Ben-Awuah, (2017), "A review of models and algorithms for strategic mining options optimization", MOL Research Report Eight, Mining Optimization Laboratory, University of Alberta, Edmonton, Canada, (ISBN: 978-1-55195-383-0), September 2017, Paper 105, pp. 79-99. 16. N. SEYED HOSSEINI and E. Ben-Awuah, (2017), "An economic evaluation of a primary haulage system for a Bauxite mine: load and haul versus in-pit crushing and conveying", MOL Research Report Eight, Mining Optimization, University of Alberta, Edmonton, Canada, (ISBN: 978-1-55195-383-0), September 2017, Paper 202, pp. 109-119. 15. N. SEYED HOSSEINI and E. Ben-Awuah, (2016), "Incorporating cut-off grade optimization into oil sands production scheduling", MOL Research Report Seven, Mining Optimization Laboratory, University of Alberta, Edmonton, Canada, (ISBN: 978-1-55195-367-0), September 2016, Paper 102, pp. 21-42. 14. D. CAVERSON and E. Ben-Awuah, (2016), "Management of mineralized mine waste as a future resource", MOL Research Report Seven, Mining Optimization Laboratory, University of Alberta, Edmonton, Canada, (ISBN: 978-1-55195-367-0), September 2016, Paper 103, pp. 43-57. 13. A. MAREMI and E. Ben-Awuah, (2016), "Open pit mine planning and waste management: A review of models", MOL Research Report Seven, Mining Optimization Laboratory, University of Alberta, Edmonton, Canada, (ISBN: 978-1-55195-367-0), September 2016, Paper 104, pp. 58-76. 12. E. Ben-Awuah, H. Askari-Nasab, T. Elkington and F. Blanchfield, (2015), "Oil sands concurrent production scheduling & waste management", MOL Research Report Six, Mining Optimization Laboratory, University of Alberta, Edmonton, Canada, (ISBN: 978-1-55195-327-4), September 2015, Paper 102, pp. 25-44. 11. M. MAHDI BADIOZAMANI, E. Ben-Awuah and H. Askari-Nasab, (2015), "Oil sands integrated mine planning and tailings management", MOL Research Report Six, Mining Optimization Laboratory, University of Alberta, Edmonton, Canada, (ISBN: 978-1-55195-327-4), September 2015, Paper 103, pp. 45-60. 10. E. Ben-Awuah, O. Richter, T. Elkington and Y. Pourrahimian, (2015), "Mining options optimization: open pit to underground", MOL Research Report Six, Mining Optimization Laboratory, University of Alberta, Edmonton, Canada, (ISBN: 978-1-55195-367-0), September 2015, Paper 303, pp. 149-161. 9. E. BEN-AWUAH, T. Elkington and H. Askari-Nasab, (2013), "Concurrent production scheduling and waste management optimization for oil sands application", MOL Research Report Five, Mining Optimization Laboratory, University of Alberta, Edmonton, Canada, (ISBN: 978-1-55195-327-4), September 2013, Paper 104, pp. 71-91. 8. E. BEN-AWUAH and H. Askari-Nasab, (2012), "Robust decision making: Coupling oil sands mine and waste disposal planning", MOL Research Report Four, Mining Optimization Laboratory, University of Alberta, Edmonton, Canada, (ISBN: 978-1-55195-301-4), September 2012, Paper 201, pp. 130-154. 7. E. BEN-AWUAH and H. Askari-Nasab, (2011), "In-pit and external oil sands dyke construction scheduling using goal programming", MOL Research Report Three, Mining Optimization Laboratory, University of Alberta, Edmonton, Canada, (ISBN: 978-1-55195-281-9), September 2011, Paper 201, pp. 121-146. 6. E. BEN-AWUAH and H. Askari-Nasab, (2010), "Oil sands mine planning and waste management using goal programming" MOL Research Report Two, Mining Optimization Laboratory, University of Alberta, Edmonton, Canada, (ISBN: 978-1-55195-280-2), September 2010, Paper 106, pp. 69-98. 5. E. BEN-AWUAH, S. KALANTARI and H. EIVAZY, (2010), "Mini-modeling and 3D conventional modeling of Fort McMurray geostatistical data", MOL Research Report Two, Mining Optimization Laboratory, University of Alberta, Edmonton, Canada, (ISBN: 978-1-55195-280-2), September 2010, Paper 114, pp. 255-277. 4. E. BEN-AWUAH, S. KALANTARI, Y. POURRAHIMIAN and H. Askari-Nasab, (2010), "Hierarchical mine production scheduling using discrete-event simulation" MOL Research Report Two, Mining Optimization Laboratory, University of Alberta, Edmonton, Canada, September 2010, (ISBN: 978-1-55195-280-2), Paper 201, pp. 278-296. 3. E. BEN-AWUAH and H. Askari-Nasab, (2009), "Open pit limits optimization using linear programming", MOL Research Report One, Mining Optimization Laboratory, University of Alberta, Edmonton, Canada, September 2009, (ISBN: 978-1-55195-279-6), Paper 107, pp. 134-149. 2. E. BEN-AWUAH, (2009), "Orebody modeling, optimization and pit design using GEMS and Whittle", MOL Research Report One, Mining Optimization Laboratory, University of Alberta, Edmonton, Canada, September 2009, (ISBN: 978-1-55195-279-6), Paper 112, pp. 220-235. 1. E. BEN-AWUAH and H. Askari-Nasab, (2009), "Simulation of a crushing process", MOL Research Report One, University of Alberta, Edmonton, Canada, September 2009, (ISBN: 978-1-55195-279-6), Paper 201, pp. 236-248. All reports and their respective papers can be found at https://sites.ualberta.ca/MOL/Publications.htm. 9. MOL Report Nine 2017/2018 - 20 papers, 378 Pages, ISBN: 978-1-55195-414-1. 8. MOL Report Eight 2016/2017 - 19 papers, 306 Pages, ISBN: 978-1-55195-383-0. 7. MOL Report Seven 2015/2016 - 13 papers, 240 Pages, ISBN: 978-1-55195-367-0. 6. MOL Report Six 2014/2015 - 14 papers, 250 Pages, ISBN: 978-1-55195-356-4. 5. MOL Report Five 2012/2013 - 11 papers, 230 Pages, ISBN: 978-1-55195-327-4. 4. MOL Report Four 2011/2012 - 15 papers, 340 Pages, ISBN: 978-1-55195-301-4. 3. MOL Report Three 2010/2011 - 17 papers, 335 Pages, ISBN: 978-1-55195-281-9. 2. MOL Report Two 2009/2010 - 18 papers, 335 Pages, ISBN: 978-1-55195-280-2. 1. MOL Report One 2008/2009 - 18 papers, 335 Pages, ISBN: 978-1-55195-279-6. "Oil sands mine planning and waste management using goal programming", PhD Dissertation, University of Alberta, Edmonton, Canada.